George Herriman (1880-1944), Ziff’s magazine, 1926. Herriman’s deco-doodle Navajo rug of a comic strip just gets better with age… The infernal triangle of Mouse, Kat and Pupp has been interpreted as the forces of Anarchy, Democracy and Fascism by some; as Ego and Id and Super-ego by others. It is, of course, all that and blissfully less. What Picasso and Braque did to wine bottles and guitars in the Heroic Cubist days, Herriman did to narrative itself. He gave us all our stories simultaneously. Behlod the comic strip’s proudest achievement: Brickism! 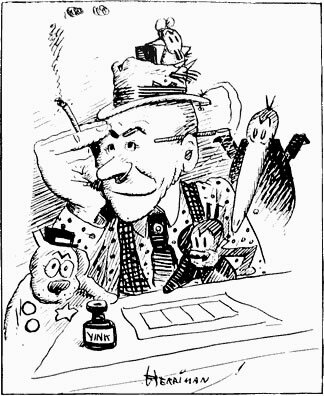 I think George Herriman’s Krazy Kat may be the only comic strip that has a genuine internal life to it. To me, I never feel like I’m looking at drawings ‘of’ things in Krazy Kat, I feel like I’m seeing the things themselves. It feels like the most inevitable work I’ve ever seen in comics. I believe his characters in a way that I don’t believe any other characters. 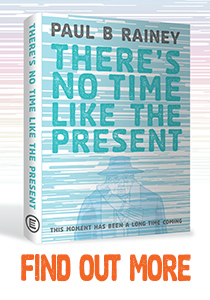 Despite the predictability of the characters’ proclivities, the strip never sinks into formula or routine. Often the actual brick tossing is only anticipated. The simple plot is endlessly renewed through constant innovation, pace manipulations, unexpected results, and most of all, the quiet charm of each story’s presentation. The magic of the strip is not so much in what it says, but in how it says it. It’s a more subtle kind of cartooning than we have today… Krazy Kat was not very successful as a commercial venture, but it was something better. It was art. Krazy Kat is so organic, so unique, that to attempt to write critically about it would be like writing a dissertation on a tree. Better simply to look. Certain aspects of the aesthetic experience lie beyond the limitations of vocabulary. In Krazy Kat the poetry originated from a certain lyrical stubbornness in the author, who repeated his tale ad infinitum, varying it always but sticking to its theme. It was thanks only to this that the mouse’s arrogance, the dog’s unrewarded compassion, and the cat’s desperate love could arrive at what many critics felt was a genuine state of poetry, an uninterrupted elegy based on sorrowing innocence. One could argue the claim, confidently, pursuasively, and with an all-but-inexhaustible store of ever fresh evidence, that George Herriman was one of the very great artists in any medium of the 20th century. Krazy Kat adores Ignatz Mouse. Ignatz hates Krazy Kat and throws bricks at her head. 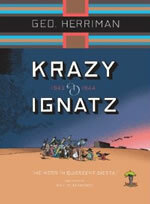 Offissa Pup loves Krazy Kat and, in an attempt to protect her, throws Ignatz in jail. This simple premise sustained Krazy Kat for over 30 years, with George Herriman playing out endless variations on the same theme in a continually evolving and organic comic, using ever changing formats and layouts, set within surreal and ever-shifting desert landscapes. Finally, Krazy Kat as it was meant to be seen: 135 full-size Sunday pages from 1916-1944, plus dozens more early comics from George Herriman. It’s the eternal triangle of the comics - Kat, Mouse, and Pupp, along with the catalytic brick. 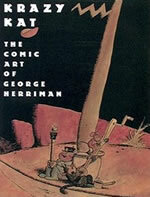 Here are their glorious, poignant, and hilarious stories from the genius of George Herriman, reprinted for the first time in their original size and colors. Included in the 14 x 17-inch collection is a sampling of all Herriman’s creations for the Sunday newspaper comics from 1901-1906: Professor Otto, The Two Jackies, Major Ozone, and more, many of which have never been reprinted before. Now, 100 years after Ignatz tossed his first brick, step back in time to delight in the timeless tales of America’s great comic strip artist and his greatest creation, Krazy Kat. 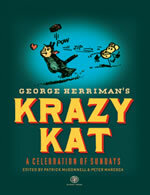 Patrick ‘Mutts’ McDonnell is the co-author of this comprehensive biography of George Herriman, featuring a wealth of background material and including reprints of many Sunday Krazy Kat pages. Essential reading for all Krazy Kat fans. Fantagraphics are reprinting all the Krazy Kat weekly Sunday pages from 1916 to 1944 in what will total a 14 volume set, designed by Chris Ware.